Work and kids have kept me extremely busy these past two weeks, leaving little time for doing what I enjoy, writing and reading. Oh well, that’s life for you. I consider it a great blessing to be able to have a job and a wonderful family to care for, although it’s not always easy! Lately, I’ve been working on polishing up part of my memoir in preparation for a writing contest in the upcoming weeks so I will be focusing more on that in the short-term. In the meantime, I have done some early spring cleaning and have noticed that my stack of books is beginning to impede on my shelf space. Many books I have read and it doesn’t seem fair to keep them all to myself collecting dust. Knowing some of you would enjoy them too and may find them useful in your grief, I’m going to give them away. They are not helping anyone by sitting on my shelf! I want to share them and donate them to all of you. There are many books, both new and used, ranging from various topics and resources on grieving, as well as motherhood, miracles, memoirs, and life stories of hope and inspiration. Thus, I’ve decided to launch monthly book giveaways combined with some random contests. I wanted to offer these books to my readers and get them into the hands of others who could use them. 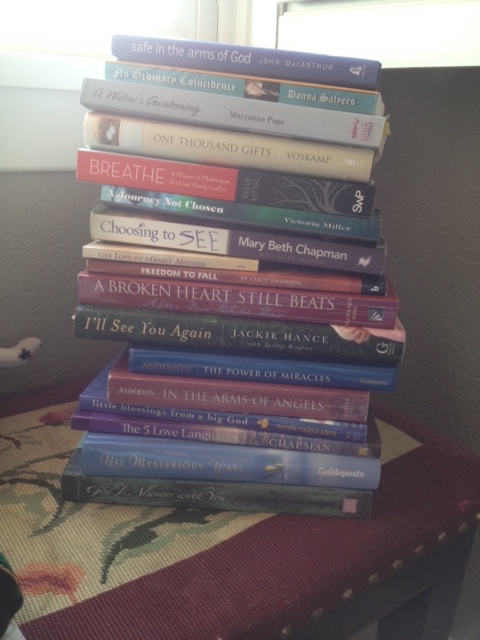 Many of these books have touched my heart and have helped me immensely at one point or another. Hearing and reading the real life stories of others who have experienced heart breaks, tragedies yet managed to find joy and the courage and calling to share their story, can impact your life in amazing ways. Each month, possibly twice a month, I will be hosting giveaways of books. In addition, I will be reviewing and reading new books along the way, primarily those who have endured the worst, yet have found hope, making positive transformations after tragedy and loss and found the sweeter side of their grief. After posting my blog about the recent book I have read, I will then be giving away a copy of that book to one of my readers. The giveaway will begin the first Monday of each month. I am so excited! Who doesn’t love a great book that takes you on a journey through a familiar (or unfamiliar) territory or time, yet lifts your spirits and leaves you feeling encouraged and enlightened? If you know others who could benefit from one of these books or simply would just like a heart warming read, please pass on the information. I’ve just finished another inspiring read and can’t wait to share. Stay tuned! Oh thanks! I hope you follow the giveaways and you are so right, I hope others pass them along too. Books how such a power to inspire and change lives!